Despite the strategic importance of the Angara project, it remained on the drawing board for most of the 1990s. The active development of the rocket and of its launch pad in Plesetsk started picking up pace only by the mid-2000s. However, even with improved funding, numerous technical and organizational problems plagued the project. After expanding the Angara project into a whole family of boosters in 1997, it likely became even more difficult to fund. During the next two years, GKNPTs Khrunichev worked on a full-scale mockup of the Angara 1.1 vehicle, which was displayed at the Paris Air and Space Show in Le Bourget in June 1999. The Technical Project for the Angara was completed a year later, opening the door to the production of the engineering documentation and blueprints. According to the design of the Angara family, its payload could vary from two tons all the way to 23 tons, depending on the number of booster "modules" attached to the identical core stage. 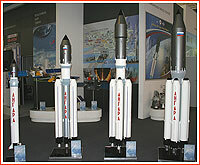 The "heaviest" Angara would replace the Proton rocket, while the Angara-3 could replace Zenit. Despite many proclamations about the strategic importance of the project, it was hardly moving during the first five years of 2000s. In an interview with the ITAR-TASS news agency in August 2014, the head of GKNPTs Khrunichev Vladimir Nesterov said that from 1994 to 2005, the project had received no more than four percent of the required funding. Around a half of this money came in 2004 and 2005. Part of the funding came from GKNPTs Khrunichev's profits earned in commercial missions of Proton rockets. During a meeting in November 2001, officials from the Ministry of Defense, Space Forces, Rosaviakosmos and GKNPTs Khrunichev made a new commitment to development of the launch infrastructure of the Angara in Plesetsk beginning in 2002. 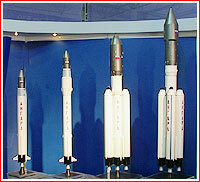 At the time, the first launch of the Angara-1 rocket from a "bare-bone" launch pad in Plesetsk was planned for 2003. However funding was not available even for the minimal infrastructure in Plesetsk. Moreover, by 2004, the Russian Ministry of Defense apparently informed developers that it will have no use for the light-weight Angara-1 rocket in the foreseeable future, endorsing the heavy Angara-5 instead. The manufacturing of the Angara's early hardware at Khrunichev in Moscow was centered at Building No. 128. The final assembly was conducted at Building No. 22. 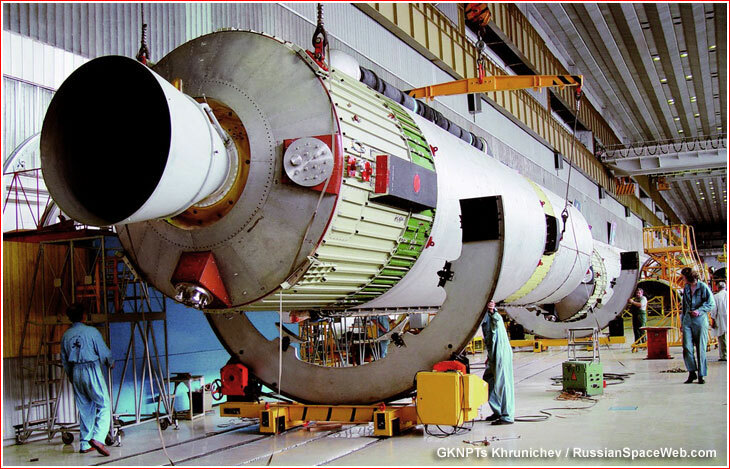 In the meantime, GKNPTs Khrunichev delegated a serial production of Angara's first stage, or URM-1, to PO Polyot in the city of Omsk, which had previously built now discontinued Kosmos-3M rockets. 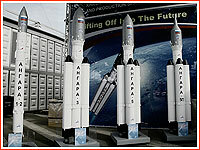 The manufacturing of Angara launchers for first two missions had been underway at GKNPTs Khrunichev, the company's press-release said in March 2011. Khrunichev also announced that all development documentation for the flight control system had been completed at NPTs AP. The autonomous tests of components for the flight control system had been completed, while integrated and software testing had been conducted at a test stand, Khrunichev announced. According to Khrunichev, practically all autonomous tests of Angara's components had been completed, including propellant tanks, dry compartments, main engines, flight control and telemetry systems. The company estimated their readiness at 99 percent. Companies located in Voronezh, Perm and Omsk were expected to manufacture various components for the RD-191 engine, with the final assembly taking place at NPO Energomash in Khimki near Moscow. In 2011, there were also reports that the serial production of the RD-191 engine was planned at the Proton-PM company in the city of Perm. At the time, Proton-PM planned to produce no less than 60 percent of these engines by 2015 with first deliveries scheduled in 2012. The company also planned to introduce a new factory at the town of Novye Lyady by 2017, which would eventually take over the entire production of RD-191. (471) On May 23, 2011, an interagency commission declared the RD-191 engine operational, clearing it for use on the Angara rocket. According to industry sources, a total price tag for the Angara project reached around $5 billion in 2012. In 2008, the first launch of the Angara rocket was promised at the end of 2010 or at the beginning of 2011. During 2009, preparations for the first test mission cleared a major hurdle with three successful test firings of the first stage booster, which also performed well during the first ill-fated launch of the South-Korean KSLV rocket. However around the same time, various unofficial reports said that a delay of the first Angara launch to 2012 would be necessary. In the middle of 2010, the first launch was delayed from 2012 to 2013. The second round of upgrades was conducted at Angara's production plant in Omsk during 2015 at a reported price tug of six billion rubles (in addition to seven billion spent on the first round from 2009 to 2014). By that time, the first launch of the Angara-5 had already taken place and the serial production of the rocket was becoming a reality. Imported state-of-the-art machines for manufacturing of tanks as large as four meters in diameter were installed at Building No. 12, where special foundations had to be built first. At the end of June 2015, a big delegation of space officials led by Dmitry Rogozin visited Omsk on their way to Vostochny. 1999 June: GKNPTs Khrunichev displays a full-scale mockup of the Angara-1 rocket at the 43rd Paris Air and Space Show in Le Bourget, France. 2000 Middle of the year: The Technical Project for the Angara family is completed. 2001 Oct. 2: Directive of the 1st deputy of the Minister of Defense to reorganize the 50th laboratory of the Zenit complex into the 50th laboratory of the Angara complex. 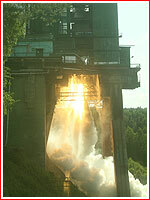 2001 July 31: NPO Energomash conducts the first test firing of the RD-191 engine for the 1st stage of the Angara rocket. 2001 November: Ministry of Defense, Space Forces, Rosaviakosmos and GKNPTs Khrunichev make the new commitment to the development of the Angara and its launch infrastructure beginning in 2002. 2001 Dec. 3: Directive of the Chief of Staff of the Space Forces to reorganize the 50th laboratory of the Zenit complex into the 50th laboratory of the Angara complex. 2004 Nov. 17: The Russian government approved a new launch site development program aimed to make Russia independent in space launches from Kazakhstan. 2004: Alfa Bank opens a 600-million-ruble line of credit for GKNPTs Khrunichev for the development of the Angara project. 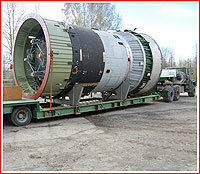 2004 Dec. 9-10: A dynamic equivalent of the URM rocket module is shipped from GKNPTs Khrunichev to the TsNIIMash research and testing facility. 2004 Dec. 22: Russian and Kazakh governments sign an agreement on the development of the launch complex for the Angara rocket in Baikonur. 2005 May 25: GKNPTs Khrunichev and Russian Ministry of Defense sign an agreement on the completion of the Angara development and first test flights. 2005 Oct. 9: The FGUP Zvezdochka officially completed the construction of the launch platform for the Angara rocket. 2006 July: A launch platform for the Angara rocket is delivered to Plesetsk for the installation on the launch pad. 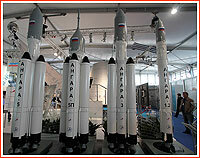 2006 August: Roskosmos promises to conduct the first test launch of the Angara rocket in 2010-2011. According to NPO Energomash, as of August 1, 2006, the RD-191 rocket engine accumulated 4,500 seconds of running time in 35 firing tests. The longest firing lasted 400 seconds. The entire test program aimed to accumulate 15,000 seconds of work in 70 test firings on 10 copies of the engine. 2006 Aug. 25-28: GKNPTs Khrunichev and PO Polyot in Omsk signed an agreement to produce booster stages of the Angara rocket in Omsk. PO Polyot would merge with Khrunichev under the agreement. 2007 Aug. 31: The meeting of the interagency coordinating group of the Angara project within Military Industrial Commission considered the development issues within the project. 2007 Oct. 12: The military-industrial commission led by Vice Prime Minister Sergei Ivanov discusses the implementation of the Angara project at the prime-contractor site. 2007 Dec. 6: NPO Energomash conducts testing of the RD-191 engine for the first stage of the Angara rocket, along with the operational hydraulic system and the gimbal mechanism of the engine. 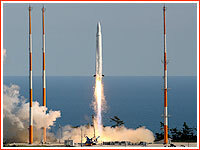 2007 Dec. 27: The KBKhA design bureau conducted test firing of the RD-0124A for the Angara rocket with an electrically driven gimbal system developed by GKNPTs Khrunichev. According to KBKhA press-release, engine worked nominally. 2009 Jan. 19: NPO Energomash announced that the last test version of the RD-191 rocket engine was going through final firings after a total of 97 tests with an accumulated firing time of 20,789. The maximum firing time accumulated by a single engine reached 3,635 seconds in 12 tests. At the time, the manufacturer had already supplied an engine for the firing tests of the entire rocket stage and promised to supply first six flight-ready engines in 2010 for actual test launches of the Angara rocket. 2009 Aug. 19: Roskosmos and GKNPTs Khrunichev signed an agreement for the development of the manufacturing base at the Proton-PM company in the city of Perm for the mass production of the RD-191 engine. 2009 November: The URM-2 upper stage module of the Angara rocket is rolled out to the IS-102 test stand in Peresvet near Moscow at NITs RKP test facility (former NIIKhimmash) for fitting checks. The thermal conditioning and fire safety systems were also tested. 2010 March 4: The Angara's second stage (known as URM-2 module) rolled out from the assembly building to the IS-102 test stand at NITs RKP in Peresvet in preparation for "cold" tests of the propulsion system. 2010 June 17: "Cold" tests of the URM-2 module, checking fueling and pneumatic systems of the rocket stage, initiated at NITs RKP test facility. Live firing of the stage were scheduled for the fall of 2010. 2010 Aug. 3: Official Russian media quote a source at NPO Energomash as saying that the RD-191 engine "burned down" during one of multiple tests. The statement implied that the engine was destroyed in a some kind of planned endurance test, not as a result of a catastrophic failure. 2010 Nov. 18: The URM-2 upper stage module of the Angara rocket fired its RD-0124A-I propulsion system for the first time at the IS-102 static test stand in NITs RKP test facility in Peresvet near Moscow. 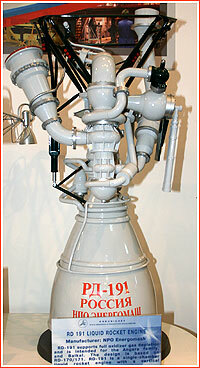 The 399-second firing simulated the performance of the engine during expected launches of the Angara rocket. It was shut down after one of the propellant components was completely used up. 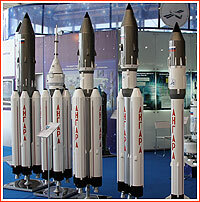 2011 March 30: A meeting of the Chief Designer Council on the Angara system is held at GKNPTs Khrunichev, Moscow. 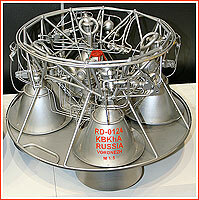 2011 May 23: NPO Energomash published a press-release declaring the development of the RD-191 engine completed. By that time, the engine went through 120 firings with a total burn time of 26,747.4 seconds, including three ground tests on the full-scale URM-1 stage and two flights on the Korean KSLV rocket. 2012 Jan. 20: NPO Energomash conducted a certification test firing of the RD-191 No. D016 engine featuring a first combustion chamber manufactured at Voronezh Mechanical Plant, VMZ. A total of 18 firings were to be conducted using three copies of the engine for six tests each. NPO Energomash did not provide any details on the results of the tests, however, the announcement about the test was preceded by unofficial sources reported serious quality problems on combustion chambers produced at VMZ. 2012 April: Zvezdochka shipyard in Severodvinsk completes factory tests of the first of two mobile erectors, which was designed for transportation and the installation of the Angara-1 rocket from horizontal into vertical position on its launch pad in Plesetsk. 2012 June 25: GKNPTs Khrunichev announces that a "test-stand" prototype (designated Article NZh) of the Angara rocket was shipped to Plesetsk. 2012 Oct. 23: NITs RKP test center completed cryostatic testing on the prototype of the upper (third) stage of the Angara-3A and 5A rocket. 2012 Nov. 14: NPO Energomash conducts the fourth of six planned live firing tests of the RD-191 engine intended to certify a combustion chamber manufactured at the Voronezh factory. During the test, the engine had successfully completed its planned 330-second firing profile, the company announced on November 16. 2012 Dec. 25: An RD-0124A engine fired for 753 seconds at KBKhA's climatic test chamber in Voronezh to confirm its performance after nine months of climatic tests. 2013 Feb. 20: NPO Energomash conducted live firing test of the RD-191 engine at its Facility No. 2, in order to certify the combustion chamber manufactured at Voronezh Mechanical Plant, VMZ. The engine fired for 30 seconds and the combustion chamber met all the specifications, NPO Energomash announced on February 21. 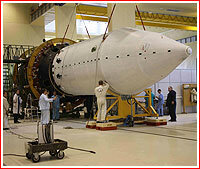 2013 February: GKNPTs Khrunichev conducts fit checks between a payload fairing and the Angara-1.2PP vehicle. 2013 May 28-31: The first Angara rocket is shipped from Moscow to Plesetsk. 2013 July 16 - Aug. 27: Three inter-agency firing tests of the RD-0124A engine clear it for the use on the second stage of the Angara rocket. 2014 Feb. 17: The Article NZh mockup of the Angara-1 rocket rolls out to the launch pad for the second time. On August 25, 2009, a Russian-built booster powered by RD-191 engine lifted the first South-Korean Satellite Launch Vehicle, KSLV-1, (top), paving the way to the Angara family of rockets. However, the mission itself failed due to the failure of the Korean-built upper stage.